** So we now live in a post C2E2 2015 world. You know, this is like when 2012 came and went and there was no Mayan apocalypse. ** I went to C2E2 this year and these big cons just don't do a lot for me. Pal Gordon basically summed up my thoughts on the big con this year so I'll send you over to his blog. Of course, I thought the same thing last year. If I was asked to describe the last couple of years of C2E2, I would say that the show is basically a giant geek-oriented flea market. It's kind of like the market in Raiders of the Lost Ark. In fact, I'm surprised that I haven't see a giant swordsman in the middle of an aisle get shot by a nerdy archeologist there. ** This is why I'll probably never get a press badge at C2E2 ever again. ** So by my estimation, there were two big announcements at C2E2 this year that basically epitomized the problem with the mainstream superhero companies. And then there's the Marvel announcement that wrestler C.M. Punk will be co-writing a Drax the Destroyer comic that doesn't even mention any artist at all. And Marvel and DC aren't the only ones who like to announce comics without artists. 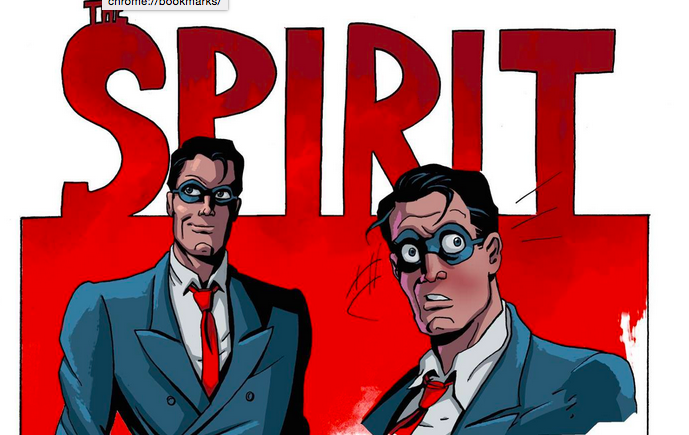 It took Dynamite a month or two to announce who would be drawing the Matt Wagner-penned Spirit revival. If you're an artist working in or have sometime in the last 15 years worked in mainstream comics and you complain that reviewers treat the art in your comics like something disposable, you need to look at how your editors and publishers treat artists in their comics. Since 2000, the trains have been made to run on time and that means that the artist is treated as something less than a full creator of a comic since most can't do 12 issues in a year. This is not the way comics should be. And it's not for a large chunk of the comic industry but when your market leaders treat artists as interchangeable cogs in the big machine, that mentality is going to feed down into your audience who doesn't know better. That's going to lead to reviewers who treat the writer like an author and an artist like an illustrator. ** Speaking of Frank Miller's Batman story, Greg Carpenter used that announcement as a launching point to write about Bernie Krigstein's classic EC story "The Master Race." Bernie Krigstein bends space and time in "The Master Race"
Always reblog Krigstein. Just look at those panels on both tiers on the right. Bending space and time, has anyone come close to doing it this way? 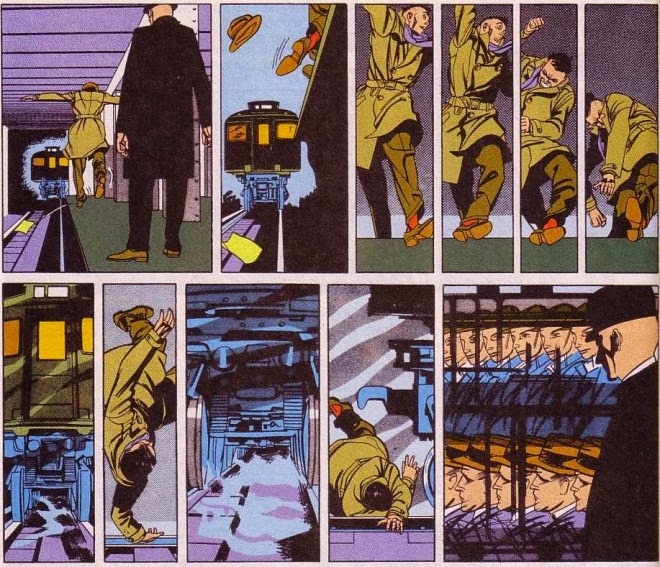 It's right there for anyone to riff on but I don't think anyone has come close to creating something as sublime as that last panel in this sequence. I keep looking for someone to be this innovative or at least brazen to steal from Krigstein. ** Andrew Wheeler interviews Asaf Hanuka about his new book The Realist. I just got a copy of this book and I hope it is at least half as good as it looks. 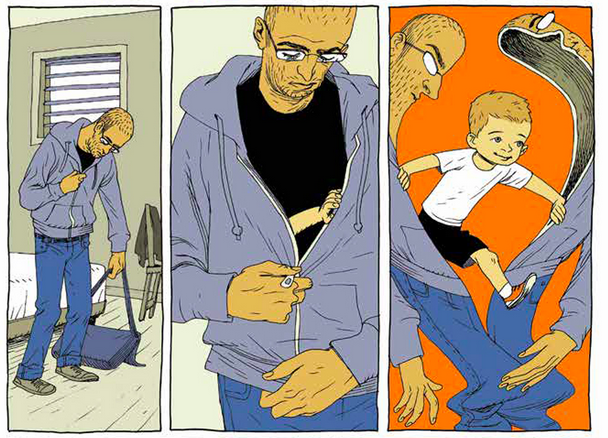 Hanuka is a wonderfully surreal artist and this story of fatherhood looks to be a tender and honest look at the anxieties of the modern world. ** Paul Gravett profiles Sonny Liew, another artist who doesn't get as much attention as he should. He's actually doing a Dr. Fate comic at DC Comics but you should really find his Malinky Robot comics. ** Our own Rob Kirby catches us up with where we can find his comics and recommends a book or two in the process. ** Do you want to see what Presidents are really doing in their notes during all of those important meetings? The Washington Post has a great feature showing their doodles and having some of their political cartoonists critique drawings. 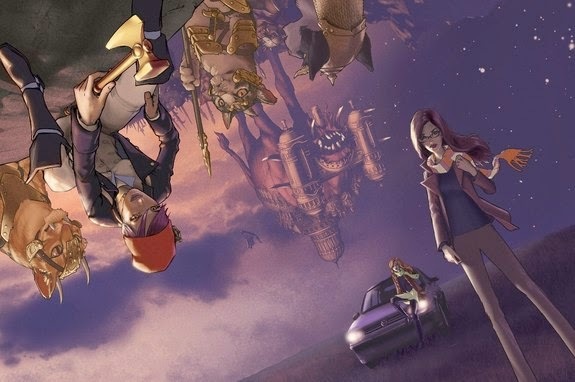 ** One great piece of news coming out of C2E2 was an upcoming creator owned book by Gene Ha. Chris Arrant interviews Ha about this project that will get launched as a Kickstarter sometime later this year. In this week's Quick Hits column, Rob K. reviews Simon Moreton's Smoo #8, Rob M. checks out Wes Craig's Black Hand Comics, Emilia P. hits Ulli Lust's This Is The Last Day Of The Rest Of Your Life and Guy T. reviews Joe Sacco's Footnotes in Gaza. Rob. M. tells us about their trip to Linework NW and they also tells us about what they got there. Rob M. kicked off the week looking at Operation Pineapple Sparkle by Francois Vigneault.